In My Mailbox is a weekly feature started by The Story Siren. Head on over there to see the roundup. 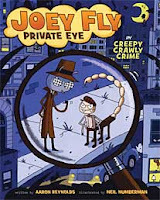 Creepy Crawly Crime (Joey Fly, Private Eye) by Aaron Reynolds, illustrated by Neil Numberman. Henry Holt, April 2009. I got this one for the blog tour they're doing in November. From publisher: Have you ever had one of those moments? You know - when you're trying to find a stolen diamond pencil box for your beautiful butterfly customer, your mosquito witness won't give you any information, and your clumsy scorpion assistant has just tampered with your only bit of evidence? Joey Fly has those moments a lot. In fact, he's probably having one right now. But never fear. When Joey Fly, Private Eye, is on the case, nothing can stop him from getting his bug! Flawed Dogs by Berkeley Breathed. Philomel Books (Penguin), September 2009. From publisher: Keep it quiet, but the world's most famous dog show is about to be attacked. Who are the daring but atrociously bred commandos led by a suspiciously beautiful daschund? Not at all what they seem, that's for certain. Al Capon e Shines My Shoes by Gennifer Choldenko. Dial Books for Young Readers (Penguin), September 2009. Moose Flanagan lives on Alcatraz with a few hundred no-name hit men, con men, mad dog murderers, and a handful of bank robbers, too. And one of those cons has just done him a big favor. Moose has never even met Al Capone, but that didn't stop him from asking Capone to use his influence to get his sister, Natalie, into a school she desperately needs in San Francisco. Al must have come through for him, because Moose got a note in his freshly laundered shirts that said, Done. As this book begins, Moose discovers a new note. This one has two words. This one was a surprise and I have to say that I was not a huge fan of Al Capone Does My Shirts, but it sounds intriguing. I might have to pick up ACDMS again because I think maybe the reason I didn't like it so much was because it wasn't what I expected it to be. Which isn't really fair. So that was my (very blue) mailbox this week. What was in YOUR mailbox? Never heard of the books before, but they sound interesting! Have fun reading them. p.s. Berkley Breathed is AWESOME! I'm interested to hear what you think of Flawed Dogs, I've read the picture book and ordered the novel for the library. I'm also hoping the second Al Capone is as good as the first (loved Shirts!). Great books you got this week. They all look quite interesting. Hope you enjoy reading all your books. I looked at getting Flawed Dogs this weekend when I went to the book store but couldn't quite pick it up. I don't know if I could hand a story about sad dogs :( I'll be interested to hear your thoughts on it then maybe I'll pick it up.